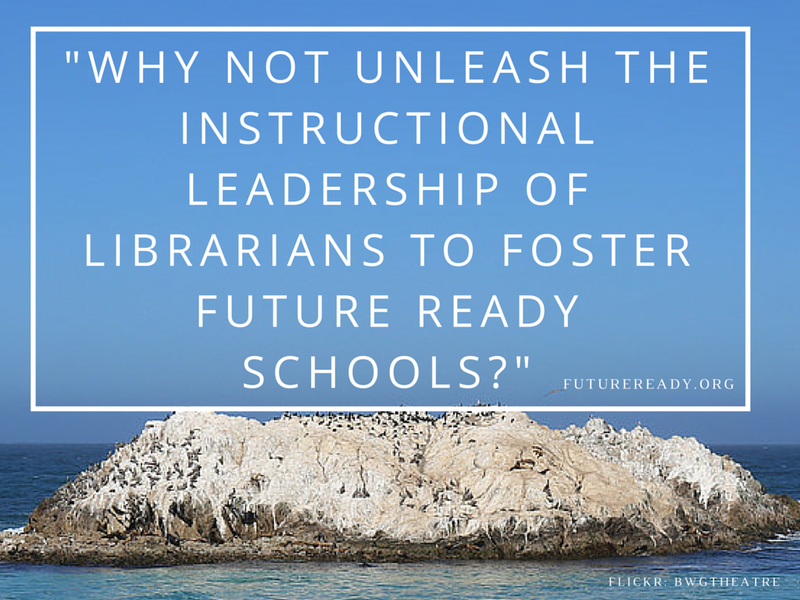 This bold question is at the center of the Office of EdTech’s new Future Ready Librarians plan. With the backing of Follett’s librarian centered Project Connect, this initiative defines the role of librarians in leading and leveraging school change. Imagine at the center of your school, supporting your vision as an administrator, a powerful, knowledgeable and connected ally who can help accelerate change. Librarians are too often pigeonholed in the school change movement, either by themselves, or by school leaders who don’t realize the powerful role they play as school wide curriculum integration supporters and instructional and technology leaders. Not only do librarians have face to face student contact with most students in the school, they also interact with almost the entire faculty to support the curriculum over time. Their reach in PD efforts or student initiatives can be broad as well as deep. 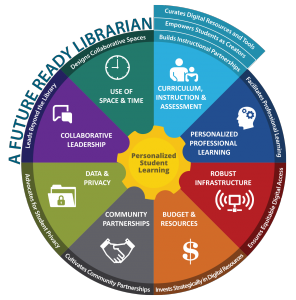 The Department of Education’s F uture Ready Librarian initiative asks how librarians can support future ready schools and how librarians can become more future ready themselves, and also provides a template for areas where librarians can lead. The initiative provides a helpful template for guiding the efforts of librarians to contribute to a Future Ready School, and identifies a variety of areas where librarians naturally provide leadership. Enabling a Future Ready Library involves more than just a Future Ready Librarian–it needs administrative support and encouragement to grow. If you are an administrator, how can you support librarian as leaders? Think of the list below as a starting point for optimizing the role of your librarian. The students deserve this educational powerhouse on their side. Contemplate your own stereotypes about libraries and talk with your librarian about them. How can you work as partners to bring change to your school? Add your librarian to your campus leadership committees and district leadership committees. If you have an energized librarian, empower them. If you have a librarian willing to learn, support them. If you have a librarian who needs to grow, grow them. Send librarians to conferences that grow their leadership abilities (Like SLJ Summit, ISTE, Learning and the Brain, NSBA, NASSP, Tech Forum, state Library conferences, Makerspace conferences, Edcamps, and more). Share technology funding with the library since it is used by all students as a way of building equity of access and innovation in the library space. Provide adequate staffing in the library including paraprofessionals and certified librarians so that the librarian can participate in school leadership teams, collaborate with teachers effectively, run new initiatives, and be mobile and flexible. While librarians can lead from all over the school, the space that librarians manage is also a hub for learning–so there must be enough support to both effectively run the library as well as allow the librarian to be mobile. Rethink the elementary “rotation” so that librarians have more time to work flexibly with a variety of students and to collaborate with teachers and school leaders. Build equity into the school’s resources by adequately funding library resources, (both digital and print) to be sure ALL students at a school have access. Incorporate librarians into space planning (both of library spaces and other collaborative spaces.). Of most staff on campus, they probably have put more thought into space planning and creative design than most of the rest of the staff due to the nature of their jobs. (It is surprising how often librarians are not part of the library design at new schools, for example). Engage the role librarians can play in building the “genius” in our students through personalized learning opportunities–the library truly is the anti-silo of the school, where students can choose their learning. Draw upon librarian expertise in regards to internet filtering for best practices and freedom of student access. Support your librarian’s efforts to build a PLN online that can benefit the whole school community. Draw on your librarian’s knowledge in curation and organizing to help with curricular tasks like building local OER materials for the district, materials on copyright, new tech and research tools, etc. Include your librarian as an expert provider of PD, or invite librarians as keynoters or trainers on topics of all sorts in your district–new tools, research instruction, engaging student readers,etc. A powerful way to disseminate best practices to students is through librarian’s outreach to teachers. Use your library as a place to build a PD collection of materials for teachers and teacher collaboration areas. These ideas are some places to start or continue to grow your own Future Ready Library. Follow Twitter chats like #tlchat for many more ideas and learning opportunities. Adding this powerhouse to your school amplifies your work in designing an environment to engage student learning and we are ready to go!